Pods VS Capsules – What Is The Difference Between Coffee Pods and Coffee Capsules? Pods VS Capsules – What Is The Difference Between Coffee Pods and Coffee Capsules? Pods VS Capsules – What Is The Difference Between Coffee Pods and Coffee Capsules? CHECKING US OUT FROM THE USA? Let us know how to get back to you, wherever you are! Coffee pods and coffee capsules are undeniably, certifiably NOT the same thing, but too many companies are marketing them as one and them same. We’re here to debunk the myth that coffee pods and coffee capsules are the same, and explain what the differences are – and which situation calls for which solution. Coffee capsules are the plastic containers with an aluminium foil seal, with ground coffee (or, in newer machine-compatible branded capsules, product such a Milo or Red Espresso) contained inside. The capsule is either part of an open or closed system; open systems allow for a broader range of product to be use in the machine, because there are many manufacturers whose capsules are compatible with that machine. Closed-system capsules include the likes of Nespresso coffee capsules, which simply means you can only use one brand of compatible capsule sin your machine. A coffee capsule is what we know moist widely, and is used for an array of products, not just ground coffee. Coffee pods are also sometimes known as coffee pads, and look precisely the same as a teabag, except for that they are round in shape. They work the same way as a tea bag, and that is the secondary difference in the Pods VS Capsules Debate. See, Coffee Pods need a slow-pressure, almost drip system in order to brew. Because of the delicate nature of the material the ground coffee is encased in, it’s risky to try brew the coffee inside in a high pressure, as the bag may burst and leave you picking out coffee grounds from your cuppa. Coffee capsules, however, are designed to withstand the pressure of a capsule coffee machine, and actually need that pressure to effectively and properly brew the product contained inside. 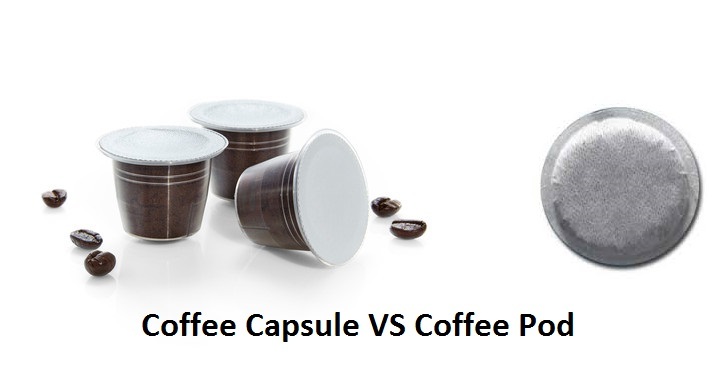 There you have it – the simple, yet far-reaching difference between coffee pods vs coffee capsules. Capsule Coffee Machine: Why Do Barista’s Hate Them?